This secured loan agreement is for use when the borrower is a private individual or a partnership. It is drawn primarily to protect the lender, but if you are the borrower, you have the opportunity to edit any point you would prefer not to include. The agreement may be for a loan by a family member to her nephew’s business; by a sleeping partner or joint venturer, or any other reason or purpose. We have provided for security in the form of physical assets to be lodged or described. There is also full provision for a third party guarantee. That may be more than the lender needs. If the right person, or people, will give a guarantee, that is more powerful than other forms of security but may lead to problems in enforcing payment. On the other hand six dumper trucks or a warehouse of DVDs may be easier to sell. The security could be any goods or property which is physical. It does not have to be mobile but goods which can be removed easily provide better security than those which are concreted to the floor. 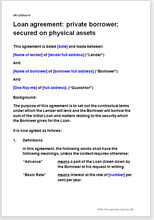 The loan is “secured” by the borrower either taking physical possession, or leaving the assets where they are and describing them in detail in this document so that there can be no dispute as to what is charged. This document provides the evidence that the item is “secured” to the lender. Remember that a dispute as to entitlement is more likely to be against a receiver in bankruptcy than against the borrower. The guarantee is worded to cover every obligation of the borrower. If a guarantee is not required, it may be deleted easily. There is no limit in law on the interest that the lender charges. We have provided for a greater rate of interest if the borrower falls behind with repayments. The agreement could be whatever you want to put in it, but we have provided a sound and comprehensive proposal containing many options. It is supported by extensive drafting notes so that you will know whether you can safely delete some provision. It is most unlikely that you will want to add new provisions, but if you do, it is easy. Our layout and use of plain English also make it very easy to edit by deletion. There is little statutory regulation relating to an agreement of this nature, so you can make, more or less, the deal you choose. Drawn outside the National Consumer Credit Protection Act 2009, this agreement is not suitable for companies in the business of lending or providing credit to consumers. Net Lawman offers three documents in this set. Each is available in two versions: one for a company borrower and the other set for a human individual or partnership borrower. All can be for any purpose. We do not provide a document suitable for charging real property because such work is restricted by law to solicitors and licensed conveyancers. What happens if things go wrong - notices, consequences and so on.